In regard to The Stanley Parable and video games at large, we discussed how players form attachment and gain pleasure from the tension between fate and free will. The characters are caught in between this two way pull, and so are the players: most of us agreed that having infinite options leaves us paralyzed, while more limited gameplay allows us to track our own progress, which is satisfying. We choose to sacrifice [some? all?] of our control in order to make quantifiable goals, to feel purposeful in a virtual world. We’ll “push arbitrary buttons” if we think we can eventually win. The idea of “creativity through constraints” is nothing new. I’m sure most of us have experienced this phenomena outside of new media — think of a class project where you’re “instructed” to “literally do anything.” (At least, more often than not this makes me feel totally lost.) 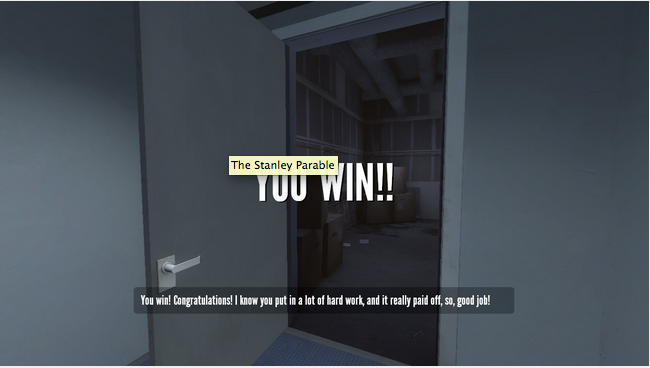 So where The Stanley Parable fails to unlock any new ideas about the lack of true free will in video games, it is (or tries to be) something we haven’t seen yet: funny. Humor is hard, for any medium. But I think exceptionally hard for video games or any type of interaction media. Where people might play video games for a number of reasons including entertainment, people generally seek out humor purely to be entertained. How does “being entertained” change if you’re required to create some of the humor? How can game developers hard-code laughs, give space for user interaction (choice), and still guarantee that players will laugh? Maybe, I’m a critic, but I don’t think this is possible. Of course, you can never be sure how a joke will be received in any medium, but definitely not when you hand over a piece of the control to the viewer/user/player. While these games are humorous, however, they are unlikely to induce belly laughs. But what they share is social satire. And satire is awesome! Truly, it is. But are other brands of humor possible in video games? I sure hope so. I can connect with the kids and their hibbidy-jibbidy technology! A big buzzword (buzzphrase) in marketing is “social media.” I’ve heard time and time again from various baby-boomers that if I can find the formula to increase brand value via new technology, I’d be golden. So how does playing Lord of the Rings Online, blogging, and reading about video-game theory help? It shows that everything is connected. There is no line where the real world stops and the digital, fantasy, or entertainment world begins. When I was a kid, there was a clear distinction between when I was sitting in my room playing video games and when I was in the living room doing homework with a pen and paper. Now, education can be “played,” Facebook is a part of class, and I listen to podcasts while doing homework. Classes like Digital Media are important because it will keep us out of an insular world of business where the models and powerpoints don’t match the information-age market. I personally have internet marketing, social media, blogging, and digital art experience. When I sit down in front of an interviewer, I let him or her know that “I’m doing business right now, as we speak.” I’m getting views, hits, and likes. Comments and other feedback on my work is coming in and waiting for me to respond every single day. I’m part of a generation that doesn’t turn off. Business now runs through society like a fluid, and old-school marketing is dead. It’s important that we start learning about these things first-hand, and studying video games is a fun way to do so. Author mevelopPosted on November 24, 2013 November 24, 2013 Categories UncategorizedTags business, digital mediaLeave a comment on I can connect with the kids and their hibbidy-jibbidy technology! I was first interested in this Digital Media course because I believed that it would help me further understand how digital media can be used to communicate ideas and stories to people of the 21st century. I thought when I signed up that we would be talking about social media techniques and how it has changed the way people communicate and how it can be harnessed to drive specific messages. Surprisingly, that was not what I got from the course. I got so much more. I was intentionally shocked when I found out the class was about video games. I have never truly been into video games and I didn’t think it was for me. How could video games teach me how to strategically use media to communicate a message? My mom was shocked when I told her about my decision to stay in the class; and then confused when I told her about all I was learning. Still she would ask: “What can you learn from video games? And now that the class is coming to a close I finally have answers for her. I found while taking the course that it has everything to do with message, audience, and community. Video games and the video game industry at large incorporate all of social media in order to create a community around a specific game, game console, or even further a community that already exists like the die-hard fans of the Lord of the Rings. Also, speaking of Lord of the Rings the class has successfully incorporated all kinds of media in relation to gaming from poetry to film in a way to show that all of media is connected and that Digital Media is just a new of shoot of media as a general form. I will be using the things I learned in this class in the future when I work in creating/producing content for television and the Internet. I have learned about the remediation of text and how that remediating a text can generate an already established fan base. I learned a lot about how to build, cultivate, and create for a community of people who want specific types of things (there it be games, franchises, or otherwise). I will definitely take a lot from this course and I am happy that I decided to step out of my comfort zone and learn about things is a really unique and different way. For this blog, I am going to attempt to put into words how I will spin this class on my future job employers. However, I love being able to write “English 259: Digital Media” under related course work because, for me, it is a unique class that I can use to my advantage. I will be able to tell my future employers the truth, that we studied the strengths and weaknesses of different media. The reason this is useful for me is because when I combine it with the skills from my cognitive studies minor, I am able to say that I can use my knowledge of how people think and perceive environmental signals while picking the best media to present my data and therefore be more successful in marketing to a target audience. I have yet to try this in an interview, but I have one next Monday for this exact type of job. So I will keep you posted on if this works or not, fingers crossed!! Our class on digital media has covered many topics, a majority of which have been in relation to creative media. In my personal future of nursing, real world application in the workplace for digital media would be limited to simulated anatomy tech and record-keeping; I mean, pagers are still used in many hospitals, so digital media? relevant, but not exactly a major priority. So instead, I think I’ll focus on a possible thing that I’ve always wanted to do; novel writing. I know, I know. What am I doing going into nursing if I love writing? Well, something has to pay the bills, right? So that’s that, I’m being practical. Anyway, with everything that we’ve gone over in this class on digital media, I think it’s really vital for any potential writers to realize the power of the various social medias and forms of remediation that exist today. Obviously getting published is the first step. But after that? The possibilities for remediation and interaction with the digital world are endless. Blogs, videos, all the social networking opportunities . . . it’s all out there, and available for authors to use. Some of them take advantage of it, as I know one of my favorite authors, Brandon Sanderson, keeps his own website updated with the percentages of progress on his books, but others remain hidden. Maybe it’s some misplaced ideas of professionalism, but I wish that authors would interact more with their readers. What it comes down to is that the field of digital media is growing ever faster, and in many different fields, from the creative to the professional, exploring the different avenues available is key to success. As we reach the end of the semester, the time comes to look back on our courses as a whole and reflect upon the greater lessons we’ve taken from them. And with the ‘Real World’ looming over our heads with the impending task of trying to enter the job market or graduate school or whatever, it’s always important to consider the more practical value taken from each course as well. With this course specifically, it might be easy to discount it due to the subject matter – the fact that it’s a course about video games definitely does not sound especially applicable to any sort of real-life job; however, with any and every job market influenced and connected to technology or media in some way, some of the skills and themes from the class will undoubtedly crossover into our future employment. Despite how hackneyed this ‘ubiquity of technology’ mantra has become, it really does ring true, remaining relevant to any discussion of this sort. For me specifically, I know that any sort of familiarity and work with digital media will augment any sort of resumé or interview I might someday tackle, as I am looking at going into some sort of marketing or advertising, specifically within the music industry. This industry especially is one in which the digital realm and digital media consumption has become integral to its continuing operation. So in spinning the lessons and activities from this class to fit my pursuits, I would definitely play up the concepts we discussed involving the online building of cultures, the separation of online and offline identities, and anything and everything we discussed involving copyrights and creativity. Still, the ultimate takeaway lies not in any specific skill or lesson from the class, but from just being able to look at media critically and intellectually – something I would definitely say I am now better able to do than I was the start of the semester.